snicholsblog: Feel the Slow Sweet Good Love of Mister Rogers (aka God)--5 Snouts up for Won't You Be My Neighbor? Feel the Slow Sweet Good Love of Mister Rogers (aka God)--5 Snouts up for Won't You Be My Neighbor? (:)(:)(:)(:)(:) 5 enthusiastic Snouts up (Understand my Snout-Based Rating system) for Wont You Be My Neighbor? 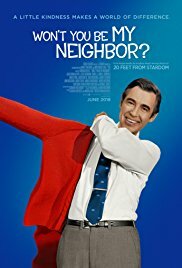 The movie about Fred aka "Mister" Rogers. A month ago I was in San Diego to see my mother and this movie was sold out on a Wednesday night. I said "WTF?" Last night, I bought tickets in advance--lots of empty seats but a solid 30 people, mostly under 40, saw this movie on a Tuesday night months after it opened. What is happening here? What's happening is that Fred Rogers is one of the comings of the Christ--I don't want to say "second" because I think there are many expressions of the living Christ consciousness amongst us. And I think that when people see Mister Rogers in action in this movie, they recognize that on some level, whether they can articulate it or not, and they want others to feel what they felt while watching the movie. Many friends recommended this movie to me. One couple described a scene where, in an early episode from the late 60s when white people were violently reacting to swimming pool integration, (white) Mister Rogers invited (African-American police) Officer Clemmons to bathe his feet in the same wading pool. Years later, in the eighties during AIDS scare, Mister Rogers invites Clemmons (who also happens to be gay) to share the pool again and Rogers dries off Clemmons' feet with a towel. The imagery of shared communion and Christ's love is obvious when you think about it, but it is not explained. It is just done. So powerful. The scene that actually caught me the most though, probably because of my years as a lobbyist, was Fred Rogers' 1969 testimony before the Senate Subcommittee on Communications chaired by Sen. John Pastore. In the movie, right before this testimony, you can see Pastore's snarkiness about PBS and his strong inclination to cut $20 million (a lot in 1969) from its funding to give to President Richard Nixon to fund his growing "exercise" in Vietnam. When Rogers testifies, everything changes. Rogers tells Pastore in his simple sweet way how his goal is to let every child know that they are loved exactly as they are right now. And you can (I almost wrote "literally" but that's a different post lol) watch Pastore's face and heart melt as he feels the importance of that ministry break through all his cynicism. I had no idea that Fred Rogers was a Presbyterian minister and his life's work was this ministry with children. Sure I watched 100s of hours of this show as a child. I loved the land of make believe. I hated Mister Rogers slow conversations with other adults and us. As I hit puberty, I mocked this show and did my best to ruin it for my younger brothers. I learned in this movie the real reason I intuitively hated Mister Rogers. It turns out that Fred Rogers was a lonely sad fat kid like me. My response to that childhood was to run like hell from that kid, to do anything I could possibly do to be popular, to be happy, and, if at all possible, to be thin (only moderate success with that). Rogers healed his body -- every day he swam and maintained a curious weight of 143 pounds (you need to see the film to know the significance of that number). Like me he became a minister. But unlike me he turned himself TOWARDS that sad fat kid, not away from it. He stopped. He slowed himself down to the speed of love. And he didn't leave one person behind. He personified divine love throughout his life. What can we do to emulate Fred Rogers? Excellent post! So good. Loved the movie too. See my blog in the Sacramento Bee! Sara S. Nichols is a dynamic public speaker who long ago appeared frequently in the media. She is the Spiritual Director of the Center for Spiritual Living, Davis and All is Well Institute. Sara's special focus throughout her career has been health care and healing. She was a public interest lawyer and lobbyist in the trenches for health care reform with Ralph Nader's Public Citizen in the '90's and a legislative staffer and lobbyist in Sacramento working for social change. She lives in cohousing in downtown Sacramento with her husband, Bill Magavern. Their two young adult children sometimes live there too. Copyright 2004 - 2018, Snicholsblog and Sara S. Nichols. Powered by Blogger.